Samantha Silver and Gemma Rose Breger are industry experts who have been using their extensive fashion and beauty knowledge to create one of the most engaging mum-focused websites out there: This Is Mothership gives stylish but realistic advice on every imaginable topic. Here they decode the wardrobe essentials that keep you sane, stylish and on the good side of your bank manager. Since becoming mums, we haven't had to alter our style too much. We don't tend to cavort around in five-inch heels quite like we used to, but the wardrobe staples we relied upon pre-kids are similar to what we use now: a good quality handbag that will last forever (and now we can pass it down to our children, so cost per wear becomes even less! ), some perfect-fit denim (that we now bulk-buy, as the knees tend to wear away quicker now than ever before…) and block heels that we can easily wear for a day's work and still manage to pick up the kids from the nursery on time. Keep reading to see our top shopping picks for the five items stylish mums will come back to time and time again. This doesn't just mean that you need to stick to classic blue jeans. Mix it up with cropped wide-leg denim to balance out your body shape or jeans that have embellishment or details on them to highlight your best features. Just make sure you buy a pair that makes you feel good. You need something that will look chic if you throw it on as you run out the door. A leather jacket is a classic that will go with every single outfit. Alternatively, you could add a shacket (a shirt jacket), which somehow has the power to add a certain amount of laid-back coolness to a casual outfit. No need to go overboard, as just a splash of something more statement than your usual daytime jewellery can liven up an outfit. It takes minimal effort, but it will make you feel more pulled together. We are both huge fans of Susan Caplan and wear a piece from its collection most days. Dear new mums, please don't let the word "heels" scare you. These are just low block heels so you can feel more like yourself and be on trend whilst running around after your kids. We've recently discovered that Next shoes are super comfy but still look super cool. An essential mum item so that you have both hands free to multitask (what we're best at nowadays). Opt for only real leather and in a neutral print (animal or monogrammed) or simple black or tan so that it can be worn with everything. Don't forget, a bag is an investment piece, and if you look after it correctly, it can last years and years. Shop our favourite pieces in the gallery below. A flash of turquoise makes the plainest outfits look brighter. The Outnet is a great source for discounted costume jewellery. 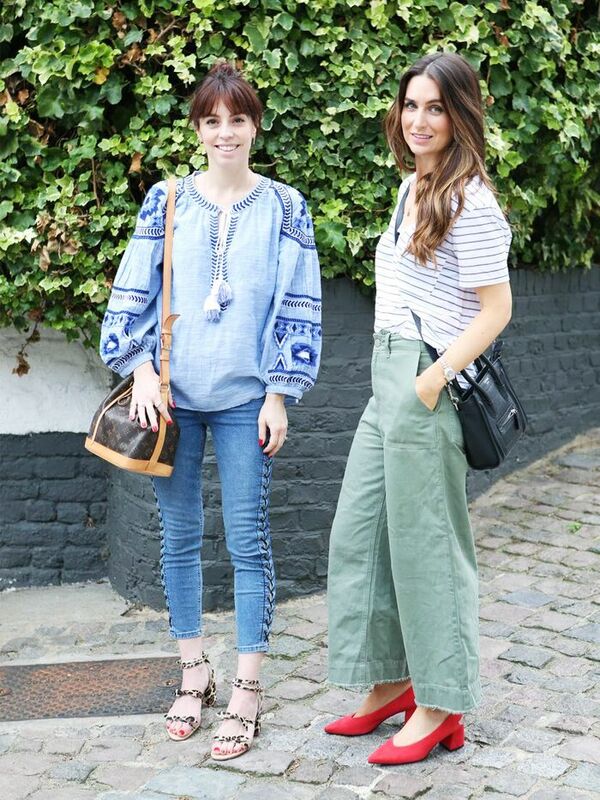 Slightly cropped flares will feel more up-to-date than plain skinnies. A little lace-up detailing gives these some extra cred. So comfy but so impactful. Just look at the heel detail. As good over a pretty dress as it is with jeans and a tee. A thing of beauty, and it only gets better with age. Mango houses some fantastic options if you're on a tight budget. The Gucci Soho bag is something of a legend among fashion girls. Next up, the best wedding guest dresses going.